Looking for advice, I have been kiting since 2001 and ij that time I have had a whole three twintips. My most recent TT I have had since 2009. Its time to upgrade however I am suddenly at the stage where as I have not looked at boards I don't really know what to look for? I am 95Kgs and I guess my style is "performance freeride" My kites consist of 2012 North Rebels, 2017 North Evo and Core XR5. I love my current board which was the top of the range Crazyfly back in 2009 its a 132X40 so quite a small board and I tend to ride powered using a larger kite than most other people on the beach, the only thing I don't like is the amount of water that hits my leg and then comes up into my face. What do I look for in terms of rocker, flex, concave, even size. I would like essentially a board that can boost high, but can also be used in surf. Really? With all that experience? About the only advancement with TT board tech has been they are lighter and more resistant to scratches - but that depends on the brand/maker IMO. nah boards much better since 2009. Demo a nobile NHP if you can, carbon version. Plenty of other great options. Sounds like you ride similar to me. Probably best to simply demo a few boards that are similar in design to the one you currently ride and see what you like. i would save the hassle and grab a buzz stinger board. Either that or out of the boards i have had and tried from mates (crazy fly included which i really liked) best no spray, comfortable, good to ride powered, boosting, which will be good in the surf/chop (not riding waves) i have ridden is a shinn monk. At your weight i would get a 135 at least but they are a bit wider than what you ride at 42, the 133 is 41 but may have a bit more rocker than your crazy fly. I had a go on a mates 2018 Shinn Bronq, I loved how smooth it felt and the lack of spray was fantastic, however I felt it lacked a little pop to get some real boost to my jumps, although that could be me just needing to adjust my technique a little. I am trying to find a CrazyFly Ltd to try out. You really need a few different boards. The 2 bronq heritage on the left have high flex high rocker great for boosting and holding down big power... super soft landings..they are fun in the surf but take power out of the kite ....on the flipside line tension is much higher so once you boost its on. Pop is on the lower side but improves if your more aggressive. No spray on legs at all. smooth atomised spray pattern looks great in photos. Side by side the Shinn Monk Ghost has the same high rocker and slightly more flex. On the right side 2 bronq Qs have less rocker and less flex so pop is good and have a real dual concave bottom and stepped tail which gives extreme grip also great for boosting ...good in the surf. These give a very controlled feel when carving and are less agressive board .... no spray on legs. And a 44 for teen knot wind. The 44 keeps me from riding my King gee too much. Very efficient with good bottom end , rides on the faster side. Smooth carving awesome in the surf eats chop and rides up over the white wash easily . Not the best for boosting but can be fun still ....give extremely good pop being a very stiff board...landings can be bone rattling if you land flat. Land tail first is much smoother. The rear end can slideout a lot so loading for an edge before boosting can be funky at times. It can be dialed in to a minimum and youll notice it more on flat water...not so much in the surf. Riden best with much more front foot pressure. You can put bigger fins on and this helps a little. Took me a while to work out my board quiver and realise some boards can hold you back. So feel free to demo demo demo......... hope this helps. Vote for the mako been on surfboards for years. But with almost no surf last weekend tried a mako. 150... gets going in 14knts maybe less 90kg rider 13m edge. The 165 Mako king is a amazing board. If you ride in lumpy surf side waves there's very few boards that could compete with all that this board offers. It goes up wind second to none , It rides over chop second to none. It carves very well but this is about ability maybe more than the board. It allows you to surf on the wave not just get pulled along the wave. It is a heavy board but this you only notice on the beach however once you are riding it's bliss. This opinion is mine based on having many boards including the smaller mako's and the best naish has to offer with a few shinn and cab's in the mix. "Not a free stlye first pick". 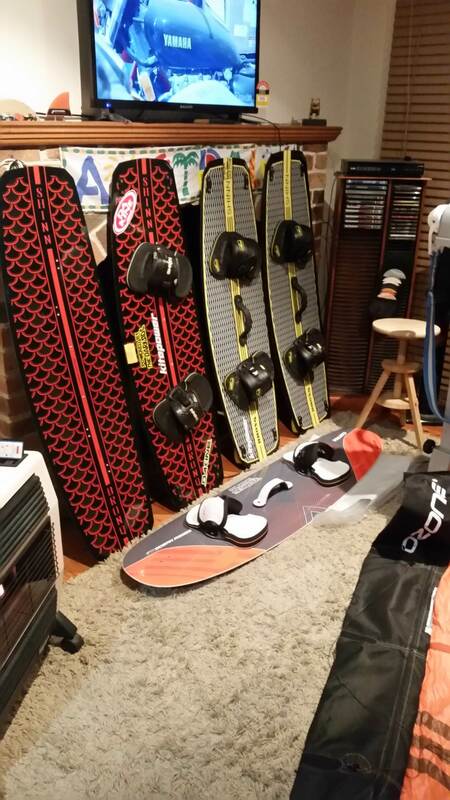 I have had two Mako Kings and a 150..... all got replaced by a Nomad Wave (non carbon, 150x50). The big K is right. Was gonna day something before he did. Mako is a very inefficient board, owned 3 in my time. Great carver in waves and fun. Too heavy overall. Gonna try mates carbon nomad wave Tt hopefully in the next few days actually. i know I am pretty heavy on my back foot due to surfing most my life. Anything you guys are doing different, style wise or setup . Gotta have the big fin and thrusters on the back. Plus recently as of 1/7/18 we now have GST added to all imported purchases. All the same shape just different carbon layup. 2 kg. Slightly more for the poverty pack team wave. Very customised board built to suit you and your weight exactly. Pick your color included and for $95 have your own grapics on it. They ride nothing like a mako with only 11mm or so concave. Very tempting to go a team wave though. The mako is good bang for buck. Totally agree with that . The mako changes dramatically from twintip mode to mutant mode . Those thrusters give you so much more angle upwind, heaps more bite on bottom turns and top turns on waves and jumping is a breeze off waves because the fins are used to edge against ,not the edge of the board like with a twintip. Tried it first up twintip mode and jumping was horrible because of the huge concave the board has . They haven't made the 150 Mako with thrusters for last couple of years , damn shame because imo the thrusters is what makes that board shine. I will say that it feels a touch heavy though. First two pics from drone on my profile Mako 150 Edge 13m in 14knts.I think a carbon copy of the mako 150 would be close to what your after Intheozone. A carbon Mako King , now your talking. Provided they could keep the plush ride through flex going this would be the best average kiters board out there. I do agree with Big tone that his Nomad is a awesome board as I have riden it. That thing carves so easily and flows on waves so well but is it better than a Mako? Don't know! About $770 at the time. Yep found the same Nathe. I just didn't enjoy the zero flex pattern and also the heaviness of the board in the end. The concave is almost too big I reckon.